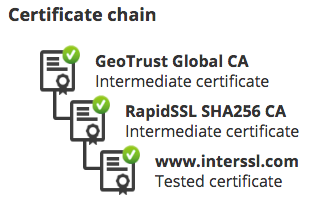 Use the following tools to verify and test your SSL setup. Besides important basic requirements like a complete & valid Certificate Chain you can improve security of your SSL setup by carefully selecting high quality Cipher Suites. Additionally, configuring HTTP Strict Transport Security (HSTS) will further improve security.